Last weekend I needed a dessert for a dinner date. I knew that the dessert needed to be able to travel and I also knew that I didn't want something too heavy since it's been impossibly hot and humid this week. I decided to make a layered chocolate cake. For years I struggled to find the perfect chocolate cake recipe. Some were too fake (tasted like straight up from the box cake), some were too dry, and some weren't chocolately enough. 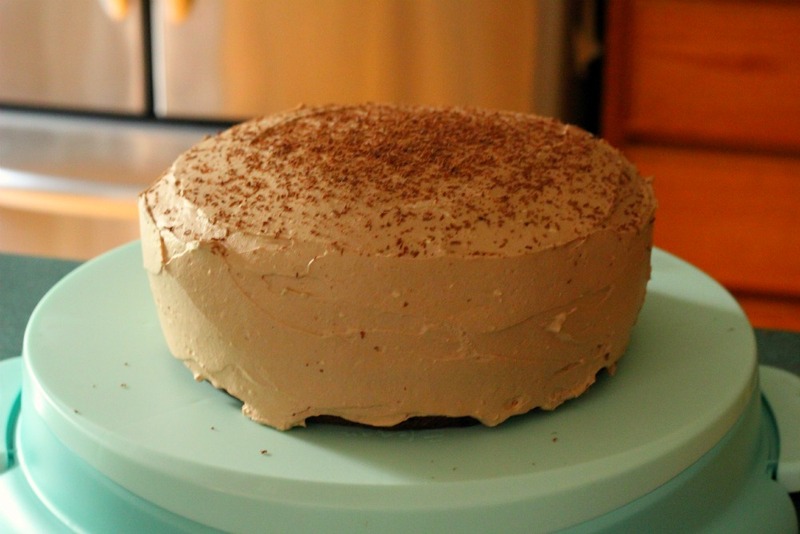 Earlier this spring I found success with Kahlua Chocolate Cake and I decided to try this recipe as a layer cake. It worked! The next dilemma was the frosting. I do not like traditional thick, sugary icing. I prefer whipped toppings that aren't too sweet. I already knew that I was serving a very rich cake, so I wanted a light, creamy icing that complimented the dark chocolate flavor of the cake. I spent some time surfing the web and watching The Food Network and I came up with this recipe that yields a light, fluffy whipped chocolate icing that's definitely not too sweet. The cream cheese acts as a stabilizer, so the icing doesn't melt at room temperature (although I'd still store this cake in the fridge in between servings). I had to stop myself from eating spoonfuls of this frosting straight from the bowl. It's that good. As an added bonus, this entire recipe, including the cake, is easy. I baked the cake the night before (two 9" cake pans for this recipe, baked for 40 minutes) and whipped up the frosting the next day. I stored the completed cake in the fridge for a few hours before dinner. I'm definitely not a master cake decorator, so just know that this icing is thick enough to make pretty swirls and designs if you are so inclined. Honestly, regardless of how it looks, this icing (and cake) were good. You can use this frosting anywhere you like. You can use it for your favorite cake recipe, cupcakes, or you can be like me and just eat it straight up with a spoon. Chill a large bowl in the refrigerator before adding ingredients. Combine all ingredients in large bowl (or the bowl of your stand mixer) and whip (using the whip attachment of a stand mixer, if using) on low speed for two minutes, then high speed for three minutes or until icing forms stiff peaks. Refrigerate for later use or frost cake immediately. Let frosted cake sit in the refrigerator a few hours prior to serving. This has me STARVING. haha. I bet this tastes heavenly! I'm not a fan of "too sweet" frosting either. The whipped frosting you opted to use if right up my alley! okay yum! I'm totally gonna try this because I love chocolate cream cheese frosting.